Public nominations for BEFFTA UK Awards; the prestigious awards ceremony that celebrates and rewards the achievements of the known and unknown black personalities within entertainment, film, fashion, television and arts is now officially open to the public. The public nomination process is expected to end in July 2011. 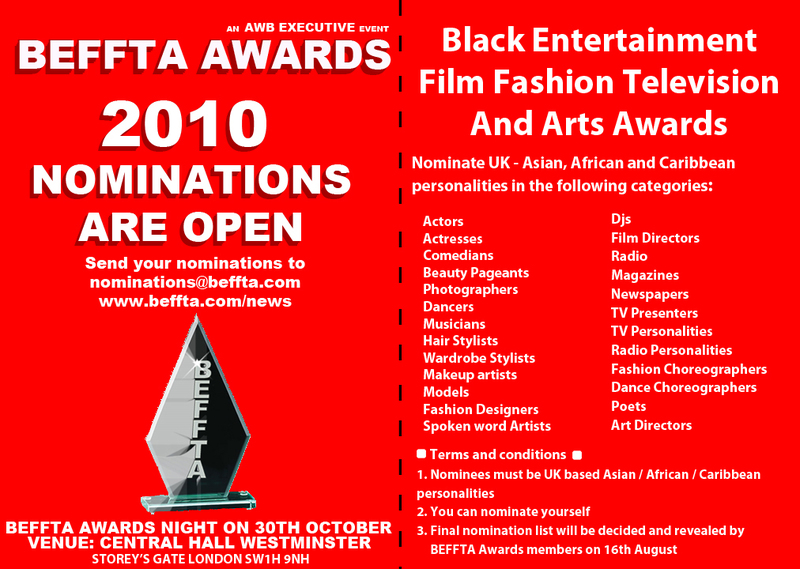 The 3rd annual BEFFTA awards night is confirmed to take place in the Black History Month on 22nd October 2011 at an exclusive prestigious venue with specially invited guests. Meanwhile, BEFFTA Awards USA 2011 debut in Antlanta was a success. Even though the nominations are purely based on the public nominating, the final nomination list will be decided by BEFFTA members and revealed at the nomination and press launch. BEFFTA Members consists of a panel of professionals from the world of entertainment, film, fashion, television and arts. This full red carpet glamorous event is set to be an amazing night with hardworking individuals from the industry celebrating their achievements in the heart of Europe’s busiest city, London. 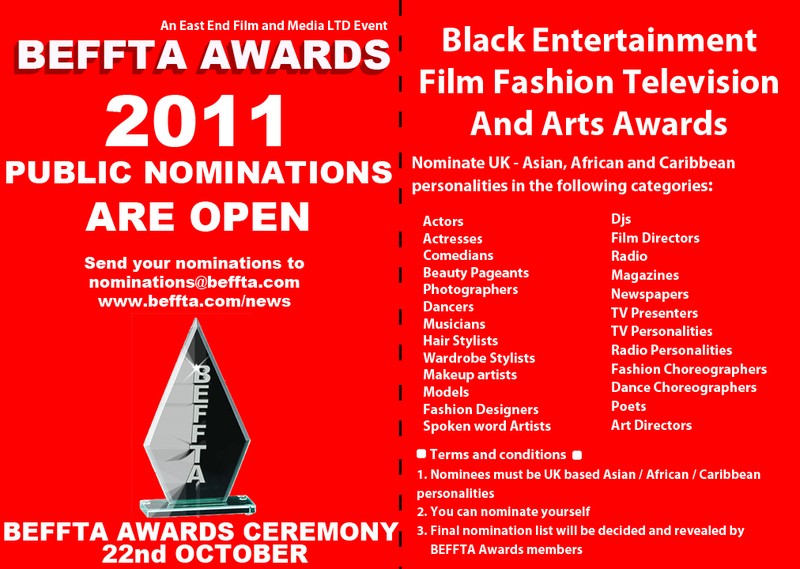 Public nominations for BEFFTA UK Awards; the prestigious awards ceremony that celebrates and rewards the achievements of the known and unknown black and ethnic minority personalities within entertainment, film, fashion, television and arts is now officially open to the public. Even though the nominations are partially based on the public nominating, the final nomination list will be decided by BEFFTA members and revealed on 23rd August with the official press and nomination launch on 1st September. BEFFTA Members consists of a panel of twenty professionals from the world of entertainment, film, fashion, television and arts. Meanwhile this year’ celebration has included a competition for designers within black and ethnic minority communities. The competition called BEFFTA DESIGNERS PRIZE which is sponsored by international celebrity hairstylist Verona white will see the best designer walk away with cash prize on the 30th October. Designers will include, shoe designers, clothes designers, handbags and accessories designers and more.